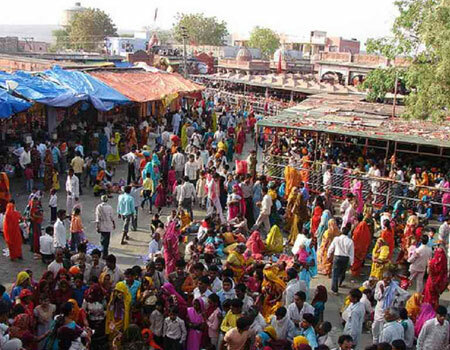 Kaila Devi (Mahalakshmi, the Goddess Of Wealth) fair is organized every year in village Kaila in Rajasthan. The fair is held in the Hindu month of Chaitra (March-April). The celebrations continue for a fortnight. The fair is a great crowd puller and attracts approximately two lakh pilgrims each year. Devotees come from far off lands to pay homage to the deity at the Kaila Devi Temple. They pray and offer cash, coconuts, sweets and bangles to the goddess, Kaila Devi. The temple is located at a distance of two kilometres from the village Kaila. Pilgrims also visit the Bhairon temple and Hanuman temple in near vicinity. The devotees follow unique rituals including the practice of Kanak-Dandotis. The devotees cover 20 kilometres upto the temple lying flat and making lines with their hand. They reach till these lines and repeat the process till they reach the temple. The celebrations at the Kaila Devi Fair add to the air of merriment that predominates the entire fair. Trading of wares is carried out hugely at the fair. Traders visiting the fair set up their shops to sell their goods. Some eat and rest while others sing and dance. In high spirits, the Mina tribals arrive at the fair. They sing and present folk dances that exhilarate the visitors. It lightens up the entire ambiance. Songs are also sung in the praise of the goddess in the courtyard.